Earlier this year, Mara Richards our health service CEO, was watching a segment about the Mildura Mens’ Shed on the then local WIN news. Mara was impressed by the members as they all wore an impressive uniform. Mara then discussed with Jim Priest the possibility of kitting out our local men in a uniform. Jim was quite enthused by the idea and gave it his blessing. Shirley Irving, recently retired Board member of RDHS, formally lodged her last community request to the RDHS Board of Management, with the concept and their support for the project, was also endorsed, unanimously. 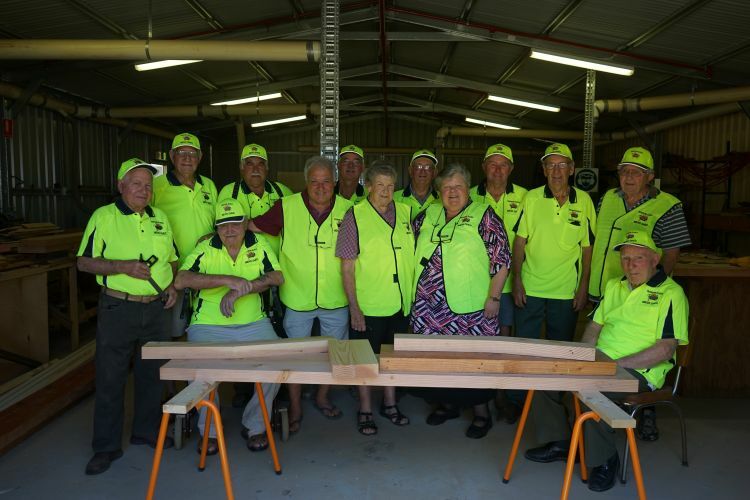 This led to RDHS, on behalf of the Robinvale Euston Mens Shed, to apply successfully, for one of the Select Harvest Community and Charity Grants to assist with the purchase of Shirts and Caps for the members. It was felt that the purchase and wearing of a uniform would enable the men to identify themselves as part of a “club”, with the main objective to give the men a sense of belonging and part of a team. Consultation was made with all of the members about the logo design and colours of the shirts, assisted by the artistic and creative talent of Connie Chirchiglia! The uniform has been locally purchased and embroidered by John Tate and staff of Work N’ Wear. The Mens Shed was formed in 2006 as part of an integrated Mens health strategy. It provides an environment for men in the community to meet and work in a supportive and welcoming place. Through their work and friendships they can share a unique mateship, that is, important in maintaining good health throughout the retirement and senior years. The group meets each Thursday between 2.00pm and 5.00pm with anything up to 12 members present at any one time and as always, there is an endless variety of works being undertaken for both private and community requests. They are currently taking orders for their famous Christmas Santa’s, Elves, Reindeer’s and Camels so get in early to avoid any disappointment!